Cherry almond granola from Eat Like a Yogi makes your cells sing! I don’t know how or why cherries and almonds were ever paired in the first place, but when you put them together with toasted oats and agave to make cherry almond granola, the result is nothing short of spectacular. If you’ve been following this blog for very long it’s no secret to you that I love granola. Granola with milk, granola with non-dairy yogurt, granola as a topping for nice cream, or just eaten by the handful. It’s convenient, easy, and has the potential to be full of nutrition. But you have to watch it here, because with many conventional granolas, the staying power of oats gets tanked by a ton of sugar and/or hydrogenated fats. It might taste good to your tongue but it’s really just a sugar bomb that will clog your arteries. Healthy granola is not remotely hard to make; it just requires a little time and tenderness. Baking it at a low temperature allows the nuts and seeds to roast along with the oats, giving the ingredients a richer, fuller flavor. Tenderly stirring it throughout the process helps to distribute ingredients and ensure even browning. It’s worth the extra care—a friend who tasted my superfood granola recently told me it made her cells feel ALIVE. Isn’t this the way we want to nourish our bodies, with food that makes our cells feel alive? 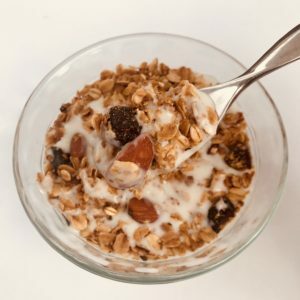 Cherry almond granola is a departure from the other couple recipes I’ve posted here, in that I tried to be more sparing. Previously I have approached granola with “the more the merrier” in mind. More variety of ingredients = more robust nutrition. I’m still on board with that idea, but if I don’t pare it back, I’ll only ever be able to offer you one kind of granola…the everything kind (which makes me think I should change the name of this one). With this cherry almond granola, I opted to use just cherries and almonds. But then my cells started to wiggle and beg for just a little more something, so I threw in some hemps seeds, too. If you don’t have any on hand, don’t worry…it’s just as good without them. Pour the oats, almonds, hemp seeds and salt into a very large mixing bowl. Melt the coconut oil until it has completely liquified. Measure the agave, then add the vanilla and almond extracts and whisk them both into the agave until they are well incorporated. Pour the coconut and agave mixture over the oats. Gently stir to combine for three minutes. Spread the granola mixture evenly over a large sheet pan (or two of them, if it seems crowded). Bake for 40-45 minutes, stirring every ten minutes to ensure even browning. The mixture is done when all of the oats are golden brown (and your kitchen smells like doughnuts!). Pour the granola back into the mixing bowl and gentle stir in the dried cherries. Allow to cool completely before putting into storage containers. If you are baking your granola in two sheet pans instead of one, keep in mind that it will cook faster. The salt can easily be eliminated or reduced from this recipe in case of dietary restrictions. I like the way it brings out the varied flavors so was fairly generous with it here. Since this recipe makes such a large batch, I like to put it into containers and freeze it. Super handy when you need a hostess gift or want to style out a friend with some deliciously solid nutrition.